J. M. Guffey, a 2520 gross ton (5500 tons displacement) freighter converted to a tanker during construction, was built at Camden, New Jersey, in 1902. She was the first ship built by the New York Shipbuilding Co. In 1918 the tanker was operating on bareboat charter on behalf of the British Ministry of War Transport, and a request was made that she be manned by the U.S. Navy as her present master did not desire to remain with the ship and the remaining crew members were willing to enroll in the U. S. Naval Reserve Force. The ship was therefore commissioned at Invergorden, Scotland, on 14 October 1918 as USS J. M. Guffey (ID # 1279). She was delayed at Invergorden until she received new boiler tubes and finally sailed on 24 January 1919 for Philadelphia, Pennsylvania. The ship had to put in to St. Johns, Newfoundland, because her boilers were leaking badly, and she remained there until leaving on 4 April for Philadelphia accompanied by the tug USS Iroquois (later designated AT-46). 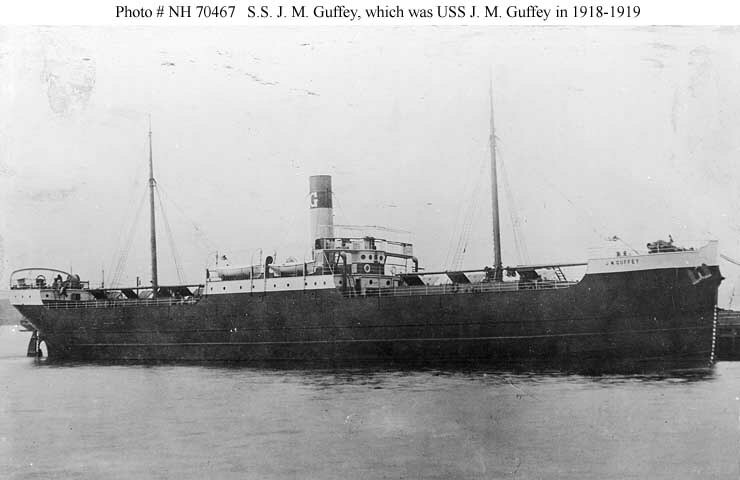 After extensive repairs USS J. M. Guffey was decommissioned on 17 June 1919 and delivered to the U.S. Shipping Board for return to her owners, the Gulf Refining Company of Pittsburgh, Pennsylvania. 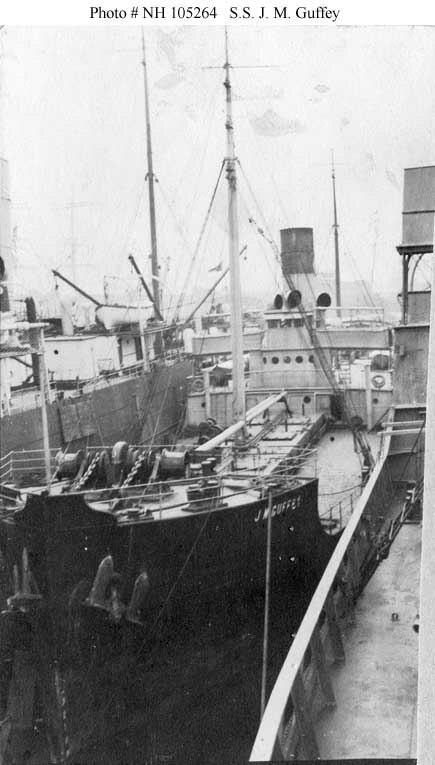 S.S. J. M. Guffey was renamed Meloria in 1926 and was scrapped at Venice, Italy, in 1935. This page features the only views we have concerning the American tanker J. M. Guffey, USS J. M. Guffey (ID # 1279), and S.S. Meloria. Shown in a photo taken by her builder on 17 March 1902 at the time of her completion. This oil tanker was in commission as USS J. M. Guffey (ID # 1279) from 14 October 1918 to 17 June 1919. This oil tanker was in commission as USS J. M. Guffey (ID # 1279) from 14 October 1918 to 17 June 1919. The photo may have been taken during an earlier inspection by the Third Naval District, possibly in 1917.